After 2,500 years of evolution, TCM [Traditional Chinese Medicine] has become a very rich and sophisticated system of rational medicine with a great diversity of theories and applications. But, in its essence, it seeks to understand and facilitate harmony in human life. It is based on a very simple principle: any system that is in harmony tends towards health, wellbeing, and sustainability. A system that is in disharmony tends towards illness, disease, suffering, and collapse. What is a system in TCM? A system is comprised of everything that creates and sustains it. Everything is interconnected and interdependent. If all of the parts of a system are in harmony with one another, then the whole system is in harmony. Disturb one thing and you create a disturbance that ripples through the whole system. This principle applies to any and all systems. For example, it applies as equally to a human being as it does to a family, community, or the environment. So we must take care to consider our actions and to take things as a whole. What are the fundamental concepts? Two concepts that are unique and fundamental to Chinese medicine are Qi (usually translated as "vital energy") and yin and yang (the harmony of all the opposite elements and forces that make up existence). These two concepts form what we might call the "roots" of Chinese medicine. Springing from these roots are the basic principles and theories about the dynamics of Qi and yin and yang, which form the "stems" of Chinese medicine. And resting on these principles is the rest of TCM theory and application, such as the causes of patterns of disharmony, which form the "branches." 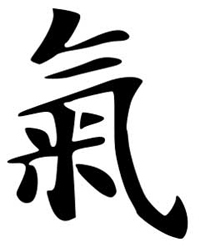 Traditional Chinese character for qi. TCM starts with the concept of Qi (pronounced "chee"). Qi is energy in the very broadest sense possible. Qi embraces all manifestations of energy, from the most material aspects of energy (such as the earth beneath your feet, your computer, and flesh and blood) to the most immaterial aspects (light, movement, heat, nerve impulses, thought, and emotion). Life, it is said in the Chinese medical classics, is a gathering of Qi. A healthy (and happy) human being is a dynamic but harmonious mixture of all the aspects of Qi that make up who we are. Qi is in a state of continuous flux, transforming endlessly from one aspect of Qi into another. It is neither created nor is it ever destroyed; it simply changes in its manifestation. In order to talk about the relationships between the various aspects and manifestations of Qi within a given context, Chinese philosophy employs the concept of yin and yang. In the Chinese perspective, given the importance of "taking everything as a whole," all things are relative. A thing can be understood only in relation to something else. This is the essential idea behind the use of the terms yin and yang. Yin and yang are terms used to describe relative opposite qualities or manifestations of Qi. If yin is form, then yang is function. If yin is material, then yang is immaterial. Yin refers to aspects or manifestations of Qi that are relatively material, substantial, condensing, solid, heavy, descending, cold, moist, cooling, dark, passive and quiescent. Yang refers to aspects or manifestations of Qi that are relatively immaterial, amorphous, expanding, hollow, light, ascending, hot, dry, warming, bright, aggressive, and active. 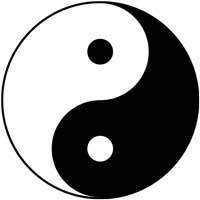 The taijitu (Traditional Chinese: 太極圖; Simplified Chinese: 太极图); is a Chinese symbol for the concept of yin and yang. Everything that is yin contains some element of yang, and everything that is yang contains some element of yin. There is nothing so solid or material (yin) that does not contain some energetic vibration (yang), and nothing so kinetic or immaterial (yang) that does not also contain some material substance (yin). Even light, so Einstein tells us, has mass. Yin and yang are continuously changing; they constantly adjust to one another, and are endlessly transforming one into the other in an eternal dance of becoming. This wonderful concept of change is beautifully illustrated in the simple image of the "yin-yang symbol." When all of the yin and yang aspects of Qi are in harmony with one another, there is health, wellbeing and contentment. When yin and yang are in disharmony, when there is too much or too little of one aspect of Qi relative to another, then there is illness, pain and suffering. How are the concepts of Qi and yin and yang applied in TCM? TCM provides guidelines for both the practitioner and patient on how to best facilitate harmony between yin and yang in any set of circumstances and how to create and circulate an abundance of Qi to sustain health and wellbeing. These are the "stems" of TCM that spring from the root concepts of Qi and yin and yang. To assist the practitioner and patient in this task, TCM offers several different perspectives on the dynamics of Qi and the interplay of yin and yang. These different perspectives are like different types of maps of the same territory. For example, if you were trying to understand what a particular part of a country is like, you might choose a topographical map showing elevation; a geological map showing the rock and soils; a vegetation map showing forests, prairies, and swamps; a watershed map showing rivers, lakes and streams; a road map; a population density map; or even a map showing points of historical interest. The map you chose would depend on your particular need or needs. But one map would not do it all. Five Phases of Transformation (sometimes called "Five Elements") - considers the stages of change or transformation that Qi goes through as it shifts between yin and yang. Vital Substances - considers the various ways in which Qi manifests in the body. The TCM Organ Systems (called Zang Fu) - describe how the various forms of Qi (as Vital Substances) are created, used, and stored in the body. The TCM Channel System (called Jing Luo) - describes and maps out how Qi and the various vital substances circulate in the body. TCM Pathogenesis Theory - is actually a collection of several theories which describe how disharmony is generated in the body. You can click on each of the links above for more information. Read below to learn more about the last item in the list, the causes of disharmony. These causes provide insight on how you can use TCM in your life to safeguard or even improve your health. What are some causes of disharmony in the body? Because the dynamics of yin and yang are always shifting and changing in the world around us, we must continuously respond to these changes in order to maintain the harmony of yin and yang in our lives and so maintain our health and wellbeing. If we do not make an appropriate response to change, then the harmony of yin and yang in our life may tilt into a pattern of disharmony and subsequently into illness, disease and suffering. The potential causes of disharmony fall into two general categories: deficiency and excess. This usually refers specifically to a deficiency of one or more of the manifestations of Qi within the body (see "vital substances"). But it can also refer more generally to an insufficiency of any of the things that would normally sustain and nourish us in life, such as food, warmth, shelter, physical and mental stimulation, the interaction with other living beings, and, of course, love. To make an appropriate response to the ever shifting dynamics of yin and yang, we must have a sufficient amount of Qi. Since most of the Qi we use in life is extracted from what we eat and the air that we breathe, Chinese medicine places considerable importance upon an adequate and appropriate diet of fresh, high quality food, and the opportunity and ability to breathe good, clean air. To avoid disharmonies due to deficiency or excess, we must have sufficient mindfulness, and mental clarity to perceive the world and determine our needs. And we must determine how we can meet those needs without creating new problems for ourselves or creating disharmony in the world around us. An unquiet or disordered mind (i.e. a distracted mind or a mind engaged in perpetual multi-tasking, a mind filled with worry, or a mind just plain "stressed out") could be considered to be not only the result of disharmony but also the potential cause of further disharmony. This is why the cultivation of a quiet mind is so important in the cultivation of health and wellbeing. Meditation, tai chi, qigong and other yogic practices have always been central in the practice of Chinese medicine and most TCM practitioners would agree that the cultivation of a quiet mind is the single most important thing we can do for ourselves. How do TCM practitioners diagnose patterns of disharmony? When someone comes to a TCM practitioner with some problem or discomfort, the practitioner first assesses the situation in its entire context (this is called the intake), then completes a diagnostic process called "pattern differentiation." The intake usually involves having the patient describe what he or she is experiencing, asking follow-up questions, observing the patient, and palpating (feeling the pulse, muscle tone, areas of pain as needed). For a more detailed look at the TCM intake process, do the activity called Visit a TCM Practitioner. The diagnostic process uses information gathered from the intake along with one or more of the TCM "maps" (or perspectives on the dynamics of Qi and yin and yang) that help place the patient's concern within the larger context of his or her life. This allows the TCM practitioner to identify the pattern of disharmony in the patient's life that is responsible for the discomfort. Once the practitioner has identified the pattern of disharmony, he or she can begin to work with the patient in creating and implementing a strategy to resolve the disharmony and restore harmony to the patients' life. Pattern differentiation, and the treatment principles and strategies of TCM form what we may call the "branches" of Chinese medicine. From these many branches come the fruits of Chinese medicine; good health, a quiet mind, and a contented, harmonious presence in the world. Kaptchuk, Ted. The Web That Has No Weaver. Contemporary Books, 2000. Maciocia, Giovanni. The Foundations of Chinese Medicine. Churchill Livingstone. 1989. Expert Contributor: Christopher Hafner, L.Ac. Editor's Comment: The original entry was created and is from Center for Spirituality & Healing, University of Minnesota and the Charlson Meadows Renewal Center.